We have Japanese Americans holding elective offices at all levels — federal, state, county and city. In their bid to win these elective offices, I don’t think race was ever an issue involving these Japanese American office-holders when they entered the elections. So, I was startled when the Tuesday edition of The Rafu carried as its top story a report about a State Assembly candidate being targeted with racist remarks. Muratsuchi said this is the first time the racial issue was raised since he entered the race. Perhaps some of Muratsuchi’s campaign flyers distributed by mail to the voters in his district might have prompted some voters to bring up the racial issue. The latest of such flyers were sent this past week. There were six photos of prominent public figures printed in color on the flyer. The six were: George Nakano, former state assemblyman; Ted Lieu, state senator; Daniel Inouye, U.S. senator from Hawaii; John Chiang, state controller; Paul Tanaka, mayor of Gardena; and Judy Chu, member of Congress. A non-Asian voter in the district might be drawn to wonder about the publishing of the six Asian persons’ photos on the campaign flyer. I’m sure there will be a lot of comments before next week’s election. Well, fortunately four of the six were from Hawaii, where they were in the sport of boxing, so when we were attacked, the fight didn’t last too long. The “hakujins” took off running. It was an interesting incident for us. I also mentioned a few times about traveling in the Southern states and having to use a restroom. I found that all the restrooms were marked “White” and “Black.” Needless to say, I couldn’t decide which one I should use. I guess I was lucky. There were a few white people in the “Whites Only” restroom but all I got was a few dirty looks. Nobody told me I was in the wrong facility. That was in the year 1943. Now, in few days, America is preparing to re-elect a black president and maybe a “Jap” assemblyman for the 66th District. Touching on racial issues, I’m sure only a few are aware that Asians make up almost 10 percent of the population in Nevada. The Asian community has the numbers to bridge the narrow gap of votes that will likely determine whom the Silver State selects as president and in many of the congressional races. Nevada’s Asian American community is the state’s best-kept political secret and it is also the fastest-growing minority population in the state. In many ways, the Asian American population is the ultimate swing voter population, but only a week from the election, 28 percent were still undecided on which way to cast their ballot. Lately, Asian Americans have split about 60 to 40 percent favoring Democrats over Republicans. But historically, the population hadn’t been loyal to one party over the other. A spokesman for President Obama’s campaign said they are trying to make sure every bloc of voters favor their candidate. But the current climate has Republicans thinking this might be the year to secure a larger portion of the Asian American vote. When it comes to the so-called Asian community, it’s mostly about the Chinese, Korean and Filipino populations. While there are a lot of Japanese Americans in Vegas, they are mostly tourists and not permanent residents. So, when election discussions are carried out, they include the Chinese, Koreans and Filipinos, not Japanese. However, the spokesman for the Nevada Republicans is Mari Nakashima as the face of the party with the Asian American community. When she is 0reaching out to the community, it helps Romney. Of course, Democrats scoff at the notion that the Republicans have made inroads with the Asian community as the Democrats have. Well, in less than week, we’ll find out. Oh yeah, by the way, I’ll be in Vegas beginning on Sunday, Nov. 11. Hope to see some of you there. We’ll know who the next president will be when we meet at The Cal. If Romney wins, I’ll buy those I meet dinner. If Obama wins, you can buy me dinner. While touching on politics, let’s jump over to Hawaii, where the race for the Senate seat is very close between Linda Lingle and Mazie Hirono. The Nikkei is a slight favorite but a win by Lingle wouldn’t be an upset. If Hirono wins, both senators from the Island State will be Japanese Americans. 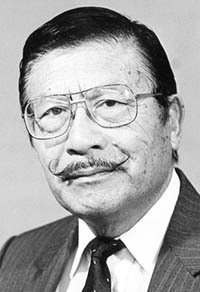 Hirono would join Dan Inouye, who has held his Senate seat for decades. No, in Hawaii, I doubt if “Jap” will be an issue. However, it will give Hirono the edge over the “haole,” Lingle. I won’t mention his name, but I recently ran a photo of the old Nisei Trading basketball team at a luncheon sponsored by the late Henry Murayama, who passed away three weeks go. I ran the photo because of the passing of Henry. Well, what always happens when I run a photo on my column is that a few people in the photo write to me to request a copy of the photo. I’d be glad to do so, but being limited in my ability to use my computer to send photos via email, I can’t accommodate the requests. So if those who asked for the photo in question can send me their postal address, I’ll send a copy via snail-mail. This past Wednesday was Halloween, so my wife asked me to drive her to Target so she could buy some candy for the “trick-or-treaters” whom we expected to drop by. In the old days, when our sons were growing up along with their friends, we would run out of candy because so many of them would drop by. Well, with the passing of time, so have the changes in our neighborhood. The new neighborhood is composed of zero kids. However, just to play it safe, we did buy a box of candy. Well, guess what? Not a single kid dropped by our house. So, I guess I’ll be munching on the candy bars — not a good thing for an old man like me. If I keep this up, I may be set back several decades when my scale hits 240 pounds. One thing about getting fat — the one putting on weight doesn’t realize how fat he/she is getting. The way I found out was a photo of me taken by a friend when I was unaware of it. When he showed me the photo, I couldn’t believe it. Talking about looking a sumo wrestler. Well, as tough as it was, I went on a strict diet and in about three months, I got down to 190 pounds, still too fat. It took me about six months to get down to 175 pounds, my high school weight. Today, my weight hit 168 pounds. Who would believe an 80-plus-year-old man would ever go below his high school weight? Well, maybe I can go back to my favorite breakfast of natto and rice. If I gain weight again, at least I can say I smell like natto. Maybe that’s why you readers may notice The Rafu has been adding more and more columnists to its pages. Would you believe I couldn’t find a laugher to give the readers a chuckle? But it opened the door for a comment I always wanted to make but would run out of space for. The topic I want to make a short comment on is the Heart Mountain Relocation Center. Next to Manzanar, it seems the Wyoming camp gets the most mention. Now I notice from a front-page article in The Rafu that they are going to premiere a play entitled “Heart Mountain.” The world premiere was yesterday at the Santa Monica College Theater. So, why am I mentioning this? Well, I am always curious when I see the name Heart Mountain because that’s where I spent a year. I never heard of any of those connected with the play, so where did they get the information about Heart Mountain? And if I do, I’ll see how accurate the presentation is for those who may not know a thing about the camp. I’m sorry I’m a little short today.